10 Little Things – A FINISH! 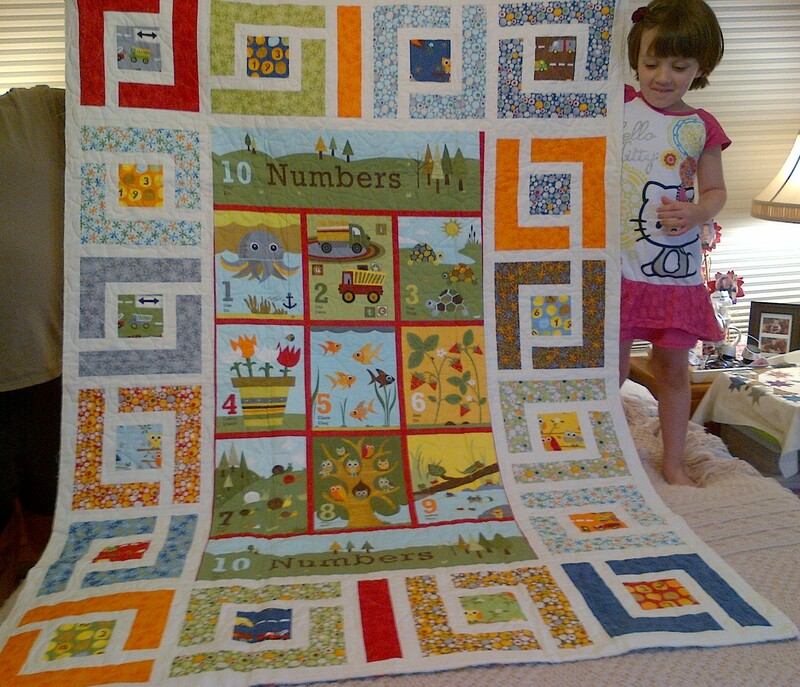 I love the feeling of a completed quilt top, but it does not beat the feeling I have when I call a quilt finished. For me, that means that someone can snuggle with it, wash it, use it, love it. My 10 Little Things quilt is now bequeathed to Brandon’s grandmother (my friend at work) and will be given to him at a family birthday party tomorrow night. Picture heavy post, but then again – that’s why I started this blog. To record and reflect back on quilt projects for myself and anyone else who is interested. The quilt pattern was adapted from a free Moda Bakeshop pattern called Jungle Path by Jessica Kelly who blogs at www.sewcraftyjess.blogspot.com. Click on “JUNGLE PATH” to open a window to the Bakeshop recipe. 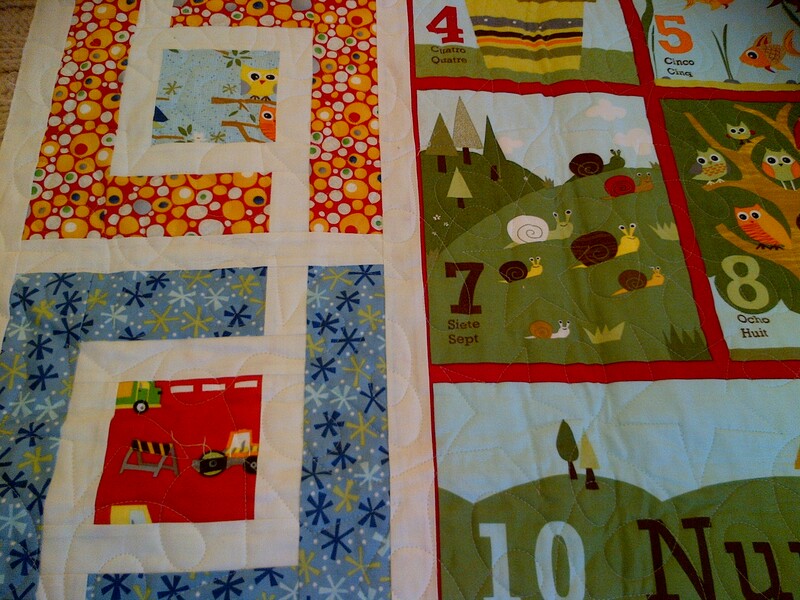 I loved the 10 Little Things collection and it came with a large panel in two colorways. 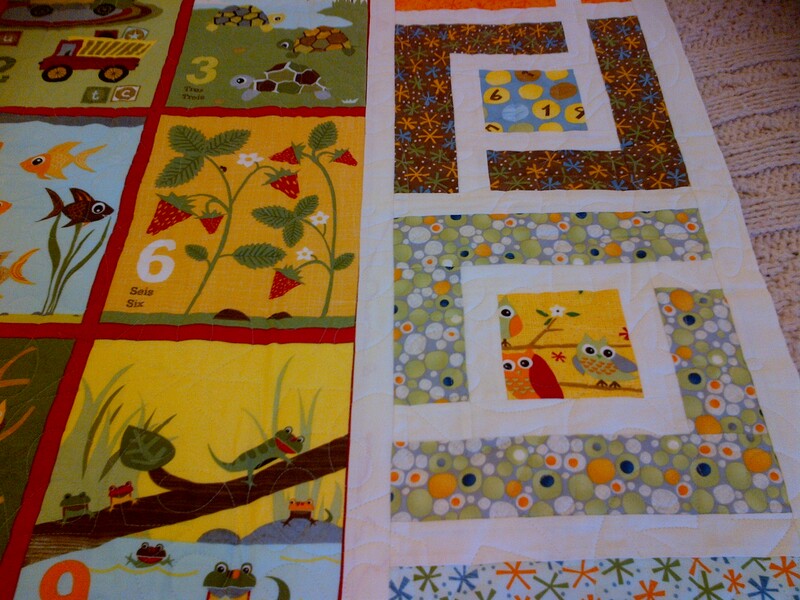 I especially liked the red, so I centered it for the quilt and put my Jungle Path blocks around it. That panel wasn’t perfectly rectangular, so you can see a bit of the red edging fading in and out as you go around the panel. The blocks fit really well around the outside, and I just had to improvise with those two extra strips in the center of the top and bottom. This is how the quilts came back from LiMa Sews – all bundled in brown paper and a navy ribbon to tie it all up. My SWOON quilt is folded on the bottom – later post for sure!! Browse some of the pictures… the pantograph that I selected was Stars and Loops. It worked out really well and was perfect for a little boy! I really love the backing – these owls are the cutest! 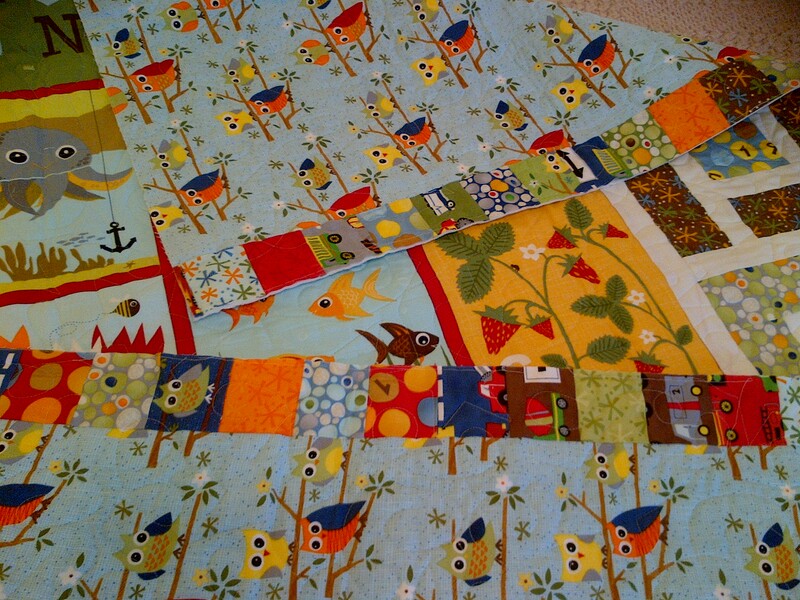 When I went to select my backing – it turned out the size of my quilt top was just past the width of fabric – around 46″. So… since I still had a variety of jelly roll strips leftover, I put them to good use in a piano key border on the backside. Once it was quilted and bound, it turned out looking like a perfect chain of squares. Linh did a fantastic job quilting this and making sure the back was centered just right so as to make the strips come out even on both sides. 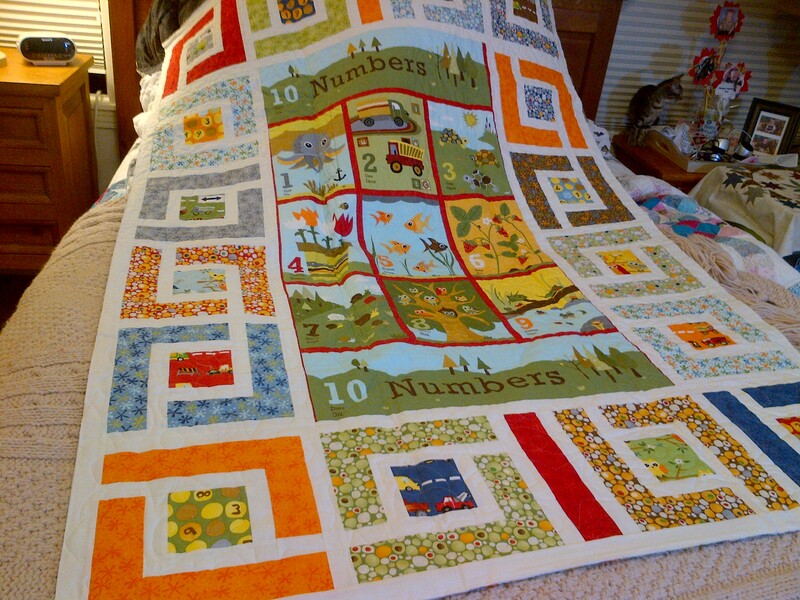 When I got the quilt back, I went looking for my extra yardage and scraps of fabric from this project – and I could NOT find it for anything. 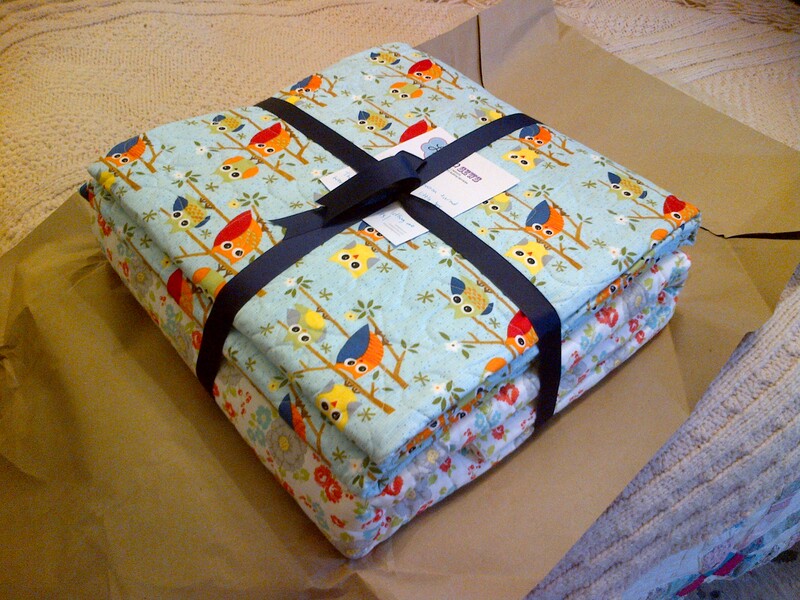 And I’m so impatient – I was ready to get the binding on and give it away. Luckily – I had just purchased a yard of the yellow grunge solid from the BOHO collection and it matched perfectly!! I did the binding last night and machine stitched it completely – first on the front, then wrapped it to the back and did it again. 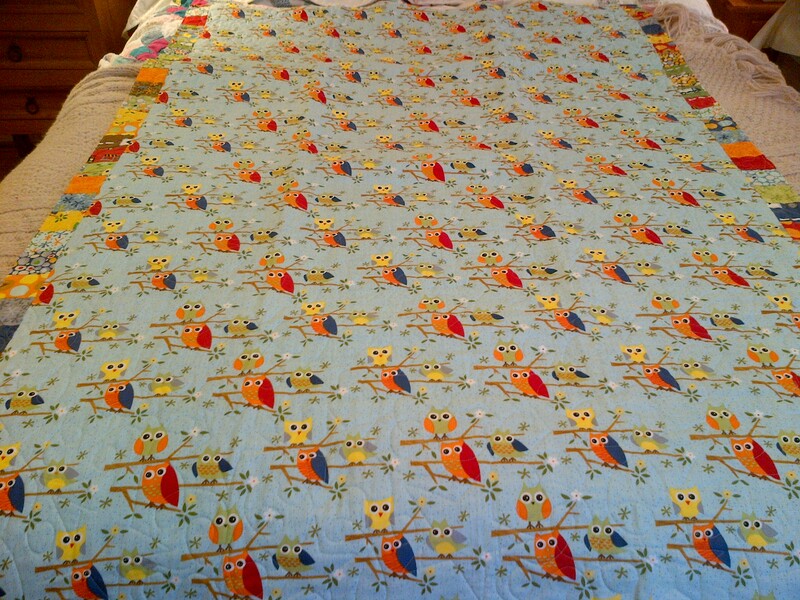 Turned out fine – I will probably do that more often on these smaller quilts. The final step was a quilt label. I had come across a laser cut, fusible backed train design on eBay and had bought it many, many months ago in anticipation of this day. However, due to my impatience, I decided to just fuse down the shapes and write out my message with a Sharpie. I don’t like how it turned out necessarily, but at least it has a label on it. Next time, I will work in the label before it gets quilted, or at least be ready to take the time to embroider it. This one just looks, well. ,… like I rushed it (which I did). I just hope it stands up to washing regularly. Last night I finished my two basket blocks for the 2013 Fat Quarter Shop Designer Mystery BOM. They came out great also – later post on that. 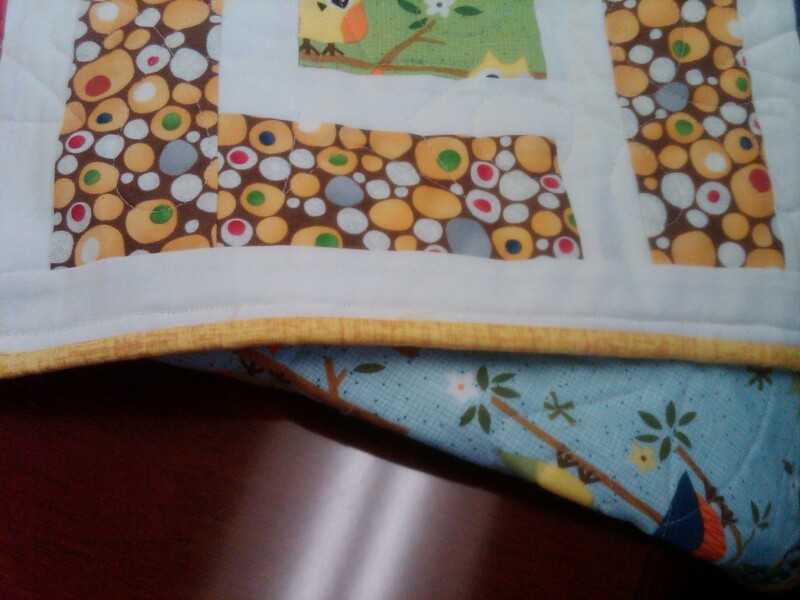 This weekend I hope to get the binding on the Swoon quilt and deliver it to my friend on Monday. 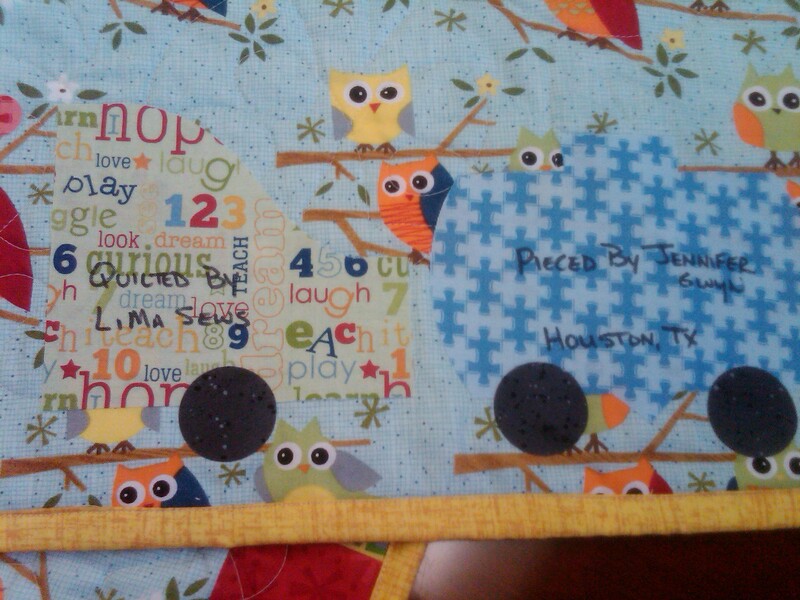 Next week – I really have to finish up my Rally quilt before that kid flies off to college in Callifornia. 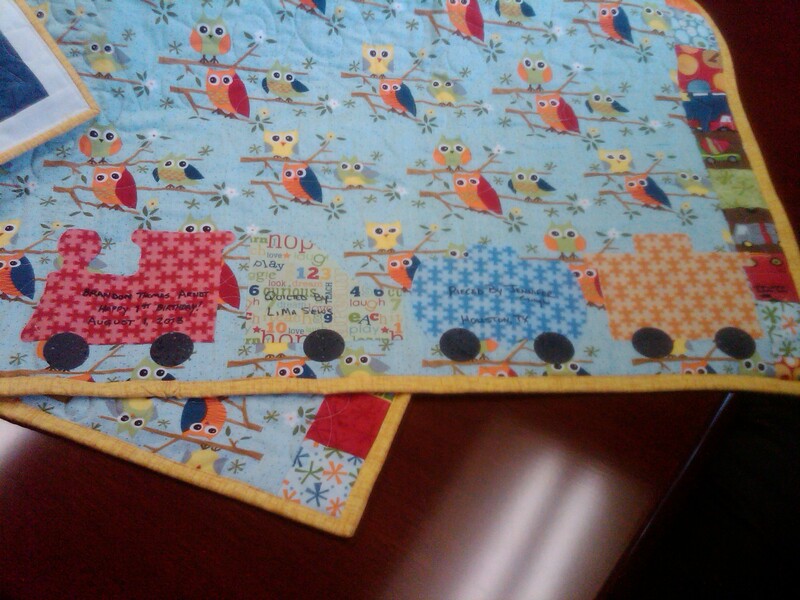 Finally, the Lincoln quilt is going to be a baby quilt gift, which needs to get done this month as well. Thanks for visiting today and making it to the end of my post! Have a great weekend! 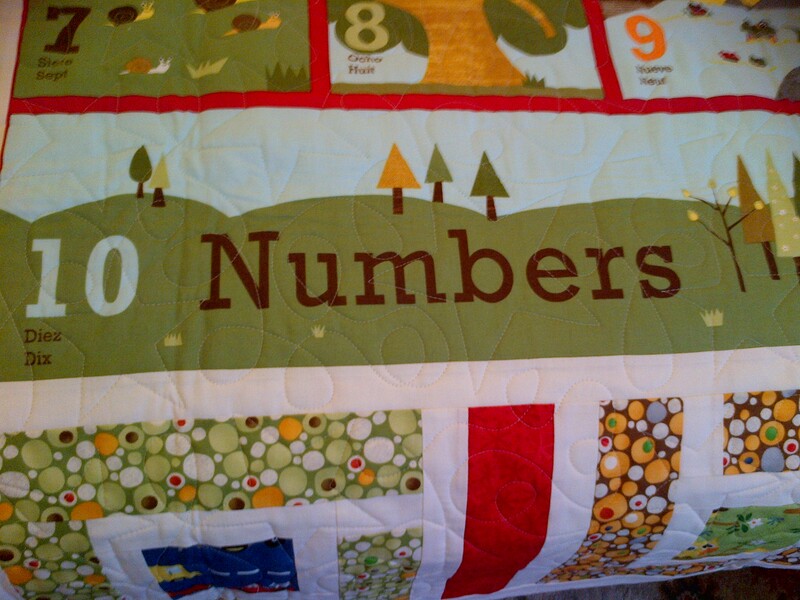 What a great quilt for a little boy!! Looks fab! 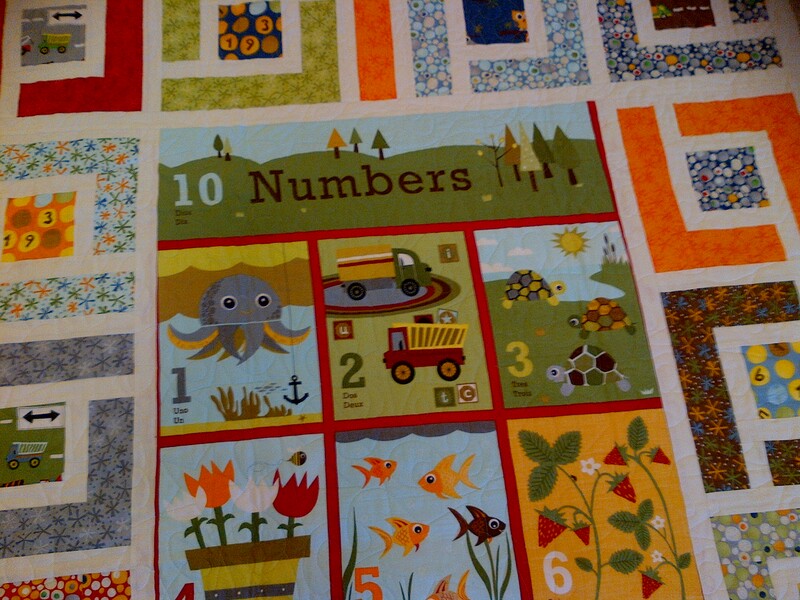 Found your quilt when I was looking for ideas on how to use the Ten Little Things panel. Loved it and have pretty blatantly copied it….twice! My nephew adopted twin boys. Yikes! Hope you don’t mind being copied. Fantastic! I’m so flattered and it is a real compliment. Thanks for sharing with me. Would love to see the finished quilts.